Aston Villa boss David O'Leary has signed Arsenal goalkeeper Stuart Taylor, 24, on a four-year deal. The ex-England Under-21 international - O'Leary's third summer signing - says he is desperate to push Thomas Sorensen for the number one spot. Taylor said: "This is all about career progression. It was no good for me to stay at Arsenal. "Thomas is a great goalkeeper. But it's up to me to push him all the way," he told Villa's website. "This is a new start. I enjoyeed my time at Arsenal but it's time to move on." 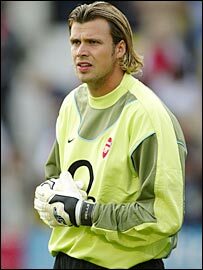 Taylor made 30 senior appearances for the Gunners but has fallen down the pecking order at Highbury and was third choice behind Jens Lehmann and Manuel Almnunia. The Romford-born keeper has had loan spells with Bristol Rovers, Crystal Palace, Peterborough and spent time with Leicester last season. O'Leary has already signed midfielder Patrick Berger from Portsmouth and Newcastle defender Aaron Hughes.